The saying that you should not judge a book by its cover is very apposite when considering the newly launched album Iberian Colours. 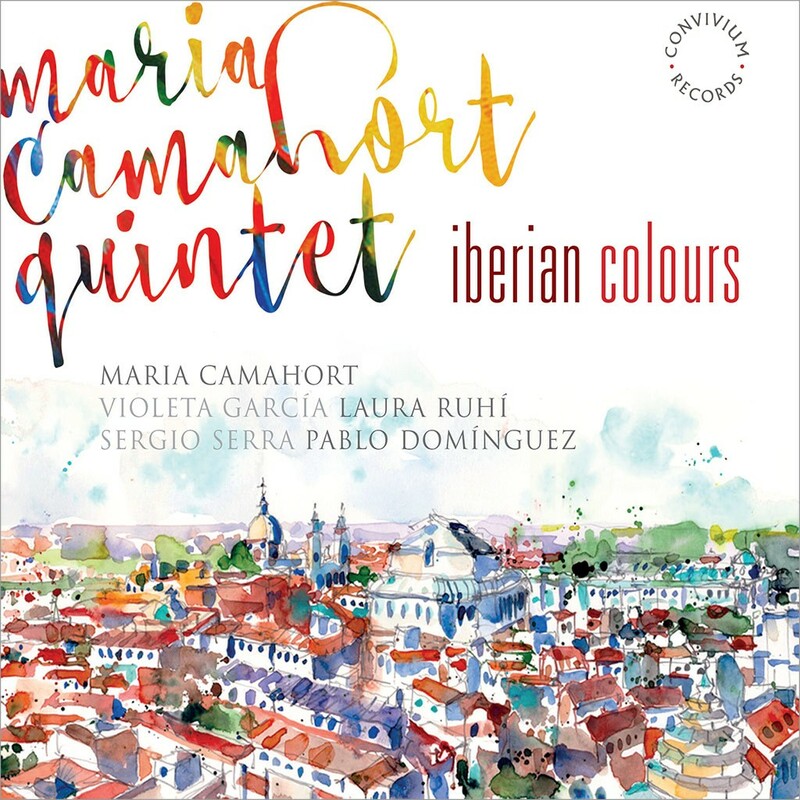 At first glance one might expect some picture-postcard musical views of Spain but what you get is a gritty and imaginative tapestry of recreations by Maria Camahort, who leads her mixed instrumental and vocal Quintet on guitar. The project explores the vibrant relationship between Spain’s art music and its roots in folk and popular cultures - a melting pot of poetry, melody and rhythm, the musical lifeblood of the nation that inspired composers like Lorca, de Falla, Granados, Mompou and Toldra, who are all represented on this album. Words are so often the stimulus of instrumental music and this concept is imaginatively explored through the introduction of the poetry or songs in selected works by Mompou and Gasull. This might sound like musical sacrilege and is of course very subjective, but the outcomes on this album are surprising successful. Sitting alongside the arranged art music are songs and more popular-styled pieces, taking us into the realms of the medieval, folklore and flamenco as well as some purely instrumental works, which further explore the influences at work. The arrangements are pared back, which enhances the musical clarity, and played with polish and élan by this virtuosic quintet. The style of performance is not purely 'classical', which is appropriate for this project as it helps create a stimulating degree of musical freedom. The recording is quite closely mic’d, but the gain is a good sound perspective and balance between the instruments and voices. A superb example is Mompou’s Cantar del alma and the solo vocal by Violeta Garcia, which takes the plaintiff refrain after the guitar’s solo prelude, then harmonised by the ensemble, and then followed by the solo soprano. The use of the two contrasting voices is effective and the space between the individual vocal and instrumental lines creates a wonderful open canvas which is explored most articulately. Two arrangements of No.s 7 and 8 from Mompou’s Cancons i danses open the recital interweaved with the songs which inspired them, creating new musical vistas. The second starts compellingly with finger-light percussion from Pablo Domingez. Though it is clearly not Camahort’s intention to improve on the piano originals they do provoke thought about their genesis. Cantar del Alma ends this trio of Mompou pieces, which are followed by two attractively-contrasted songs: one a suitably impassioned Catalan traditional piece, and the other, the inspired Canticel by Toldra. The arrangements once more work very well and do not over-power the impact of the words which carry very different messages and are, I should add, beautifully rendered by the quintet’s soprano voice, Laura Ruhi-Vidal. The stark sonorities of Gasull’s Bosc played on cello and guitar come almost as a shock, but listen again and the modern sounds reach back to ancient roots and then the tenor of the piece changes as the cello takes the melody in an impassioned mood. In this piece Maria Camahort and cellist Sergio Serra offer imaginative and inspired interplay which follows through to Fe and Lullaby also by Gasull, played by the Quintet. This is modern but accessible music. Flamenco provides the inspiration for the next three songs: through the cross-fertilisation with jazz from Chano Dominguez and the more traditional declaration and passion from Maria Camahort who sets poems by Garcia Lorca. This is followed to good effect by a dramatic solo guitar performance from Maria Camahort in de Falla’s Homenaje: Le tombeau de Claude Debussy and joined most tellingly in her arrangement of Granados’ well known Danza oriental by violinist Violeta Garcia. The recital ends with two traditional songs collected by Garcia Lorca: Las Morillas de Jaen offering superb vocal performances punctuated by a brilliant instrumental accompaniment, and with the ebullient El Cafe de Chinitas providing a rousing and fitting conclusion. Repeated listening to this fascinating album brings to mind interpretations that have been nurtured through careful research but developed through live performance. The recorded performances are very polished and have not lost the sense of live spontaneity, which, thanks to Youtube you can also explore. I found the album stimulating and interesting with an exceptionally well-written booklet. Though I can understand that not all the arrangements will appeal, the album taken as a whole is warmly recommended.